Here at Steelers Gab, we try to get to know the enemy of who we are playing Sunday. So with that, we present 5 questions with DolphinsGab.com editor Brant Houghton. 1. 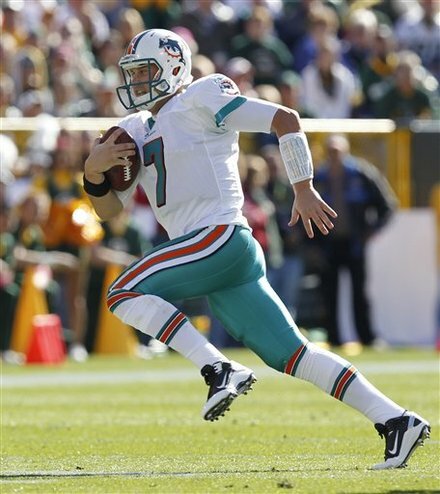 The Fins have been beaten badly in their last two home games, and while they made big strides last week at Green Bay, what has been the issue at home the last two games. Personally I do not think the Dolphins two losses have anything to do with being at home. It just so happened that some things went wrong in those two games that caused for the end result of two consecutive losses. The special teams play has been horrendous up to this point, and is finally starting to pick up, but other than that, the Dolphins have not necessarily been struggling at home, they just happened to lose two games at home so far this year. It boils down to purely coincidence to me. 2. What’s the biggest concern for Miami heading into Sunday the way the Steelers play defense? I think the biggest concern has to be getting the running game going. The Steelers are ranked #1 in run defense by far, only allowing a little over 60 yards per game. The reason the Dolphins are 3-2 at this point is because when they fail to run the ball, they struggle to win ball games. Tony Sparano is 21-17 right now in his coaching career, and out of those 21 wins, 18 of those games the offense has ran the ball more than passed, and out of the 17 losses, 15 of those losses, the team passed more than they ran. So that fun fact sums up the Dolphins offensive philosophy for just about everyone who wants to know. 3. Is Brandon Marshall getting the ball enough? If not, why not and do you expect that to change? I think Marshall is getting the ball enough. I think the right amount of balls for him is right around what he is seeing per game, 15-18 balls. Like I mentioned above, this Dolphins team must run the ball effectively still at this point to win ball games. They simply cannot put the game into young Chad Henne’s hands and expect him to pull out the win week in and week out. He is just not in that stage of his career yet. While Henne can make all the throws, and pass effectively, I think Marshall is just fine where he is at in terms of balls going his way right now. He was brought in to perform a multitude of things, among such as blocking, drawing double teams, providing a red-zone target, and attracting attention away from the running game. He was not brought here to be our only offensive weapon, but be the perfect compliment to the running game. 4. Is this a playoff team? If not, are they close and what are they missing to be a serious contender in the AFC? I think that this team is a playoff team, While they may not make the playoffs this year, I think they are one of the best up and coming teams in the league, and are only a few pieces away from perennially contending for Super Bowl titles. Miami still needs to add an elite tight end, as the two tight end sets are their bread and butter in the red-zone. The Dolphins will also have to look for some offensive line depth, as I think they will need to find a center and an elite pulling guard as well. Since the team is so young, there is more room for improvement without a doubt, but because they are lacking the above pieces, I doubt they will get anywhere close to contending for a championship without them. They miss Justin Smiley and the 2008 version of David Martin. I think the Dolphins actually pull this one out. I have yet to pick against my team this year, and I’m not going to break that homer streak yet. I think Miami gets the win 20-17 after the team finds a way to score via the run inside the 20 yardline. The Steelers may have Big Ben back, but I think Marshall can have a big game, and the run game can contribute just enough to carry this team to victory. Also watch out for Cameron Wake and Jake Long to have big days. I’m looking for Long to shut down James Harrison, and Wake to have 1.5 sacks, along with pressuring Roethlisberger for most of the game. Be the first to comment on "Knowing the enemy – 5 Questions with Dolphins Gab"